As a combination of their passions for craftmanship and technology, Norman Foster paired up with Italian furniture-makers Techno in the late 1980s to develop the Nomos System, an office furniture system, adaptable that further developed concepts explored by Foster Associates in previous pieces of furniture. 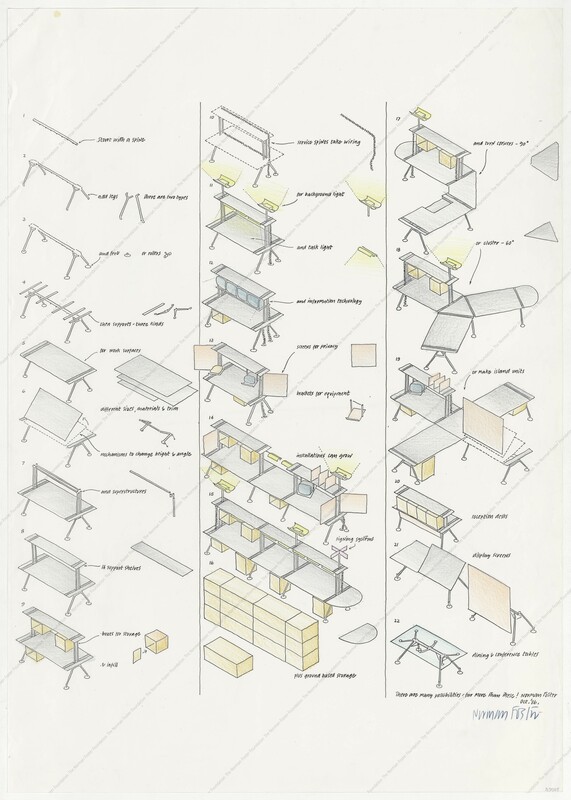 Conceived as a kit-of-parts furniture it created a system that was flexible and able to adapt to the various situations a contemporary office could face. Tecno was founded in 1954 by the Borsani family, that had a strong tradition of furniture craftsmanship specially with woodworking. Osvaldo Borsani, together with his brother Fulgencio Borsani, decided to take a step forward and switch from traditional craft to industrial manufacturing and created Tecno, betting for technology. They rapidly gained a reputation through the 60s, and in 1968 they launched “Graphis” an office furniture system that had a great reception not only in the Italian market, but was highly recognized worldwide. The Graphis system was a success until the 80s, when Tecno realized it was time to update the original concept. Back in 1980 Foster Associates were planning to move to Great Portland Street studio, which would be their home for a decade. 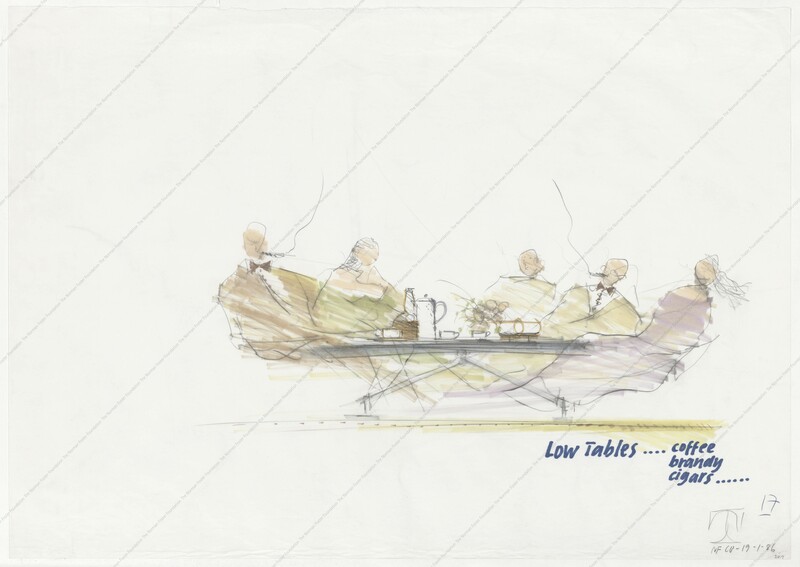 As they failed to find a furniture system that would adapt to their needs, they developed a fixed-top table and more flexible furniture pieces, with a height-adjustable foot detail, that was later also implemented in the Renault Distribution Centre, and that would evolve into the Nomos System. 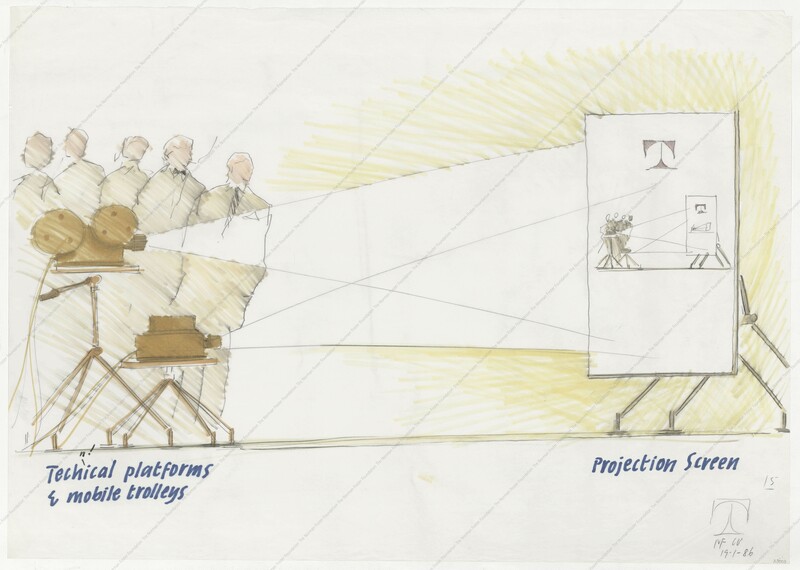 The Great Portland tables had a degree of freedom that allowed the transformation from a desk into a folding drawing table, a projection screen or a flip-chart. Therefore, when Foster agreed to collaborate with Tecno, he was still seeking for the same concept: flexibility and functionality of office furniture design, developed hand in hand with manufacturers with a tremendous expertise on metalwork. Foster devised a furniture system that could provide a solution for a meeting table, draughting table or a desk. A system that offered unlimited flexibility, yet was governed by the optimum ergonomics of the body, even if seated or standing. Foster long-life passion for aircrafts, lead him to analyse how the cockpit of a modern passenger jet works. He realised how controls weren’t restricted to table-top levels. Just as it happens in the cabin, controls should be easily reached by the crew when seated, such functionality equally pertained to office workspaces and was a key in the design of the Nomos System. The prototype system, named ‘Nomos’, was launched at the Milan Furniture Fair in 1986. The name ‘Nomos’ for the furniture system aimed to describe the essence of the project . In the Tecno catalogue from 1986 explained how ‘Nomos’ comes from the Greek term, that literally means, ‘the law’, as ‘man controlling the chaos of his environment’. This points to the fact that while, from both a functional and from a manufacturing perspective, Nomos is an ultimately flexible system, it is, none the less, highly distinctive. The system presented for the Great Portland Studio, presented a lack of flexibility as the numerous welds kept it from being movable. To reduce the number of welds, together with Tecno, a kit-of-pieces system was developed. The solution was embodied into a light assembly organized by a spine, with a vertebrae-like conduit that carried cabling. The furniture pieces, touched gently the floor with slender legs, in a way similarly to how grasshopper’s find their stability. Tecno’s expertise of craftmanship and technological advances, machine controlled tools, together with Foster’s clarity on the concept made a good combination that efficiently produced the Nomos components. Numerous references with the aerospace industry in addition to the cockpit concept were applied. For instance, the adhesive used to stick the leg to the feet was the same used in aircraft manufacture. It was precisely that kind of open-minded approach, looking for optimal solutions through technology, regardless of their original area, a common ground for both Foster and Techno, and something that made their collaboration fruitful. They even created robot-controlled machine patented by Tecno and installed in late 1987 specifically to facilitate production of the Nomos system. With the recent appearance of computers in work spaces, Foster developed a flexible solution to organize all the wiring. Highly innovative vertebrae system that contained different types of wiring, and accommodated them accordingly to work necessities. Again looking at aircrafts, the concept of the wiring backbone roots in the highly flexible wiring systems used in warships which have to respond to various requirements in the minimum timing. The vertebrae system allowed the user to employ exactly the amount needed, rather than generating an already built system. This way and following the base concept, the solution created a much more flexible approach to the problem.